After doing a competitive analysis of your market landscape the next level of detail most people want to perform is a key competitor analysis. When I was a product manager, I tended to focus only on the product features, user experience, design and technology during my competitive analysis of a company. That’s usually what most CEO’s do – after all product is the #1 thing that most customers see, touch and feel that matters to the most. Turns out that’s an incomplete view of competition. I had a chance to see a complete view when we did a comprehensive audit of the top 2 competitors before we sold our company. It is pretty obvious now, but you can get so much information from external sources such as social networks, email newsletters and blogs that to get a comprehensive 360 degree view of the competition, you can clearly understand where they came from, and where they are headed. I put a partial list of sources that you might want to consider to get competitive information from in the chart above. Here are the top questions you might want to consider getting answers to understand your competitors strategy overall. What events are they attending? Speaking? Presenting? What are they announcing? Investors? Management? Customers? What are their open job positions? Who have their hired? 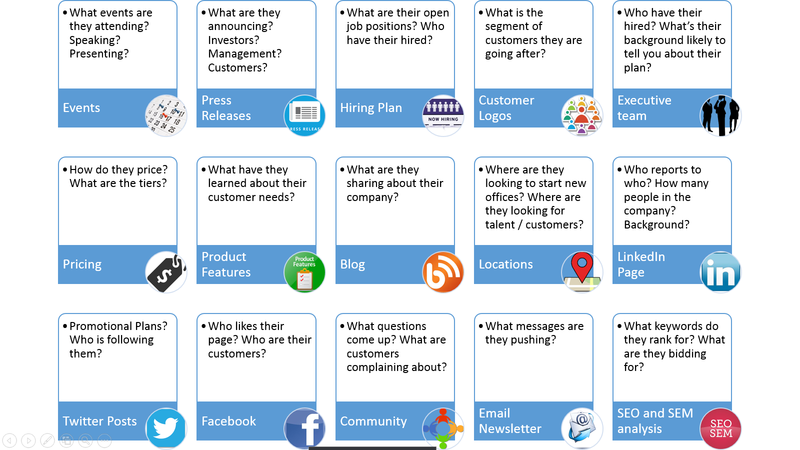 What is the segment of customers they are going after? Who have their hired? What’s their background likely to tell you about their plan? How do they price? What are the tiers? What have they learned about their customer needs? What are they sharing about their company? Where are they looking to start new offices? Where are they looking for talent / customers? Who reports to who? How many people in the company? Background? Promotional Plans? Who is following them? Who likes their page? Who are their customers? What questions come up? What are customers complaining about? What messages are they pushing? What keywords do they rank for? What are they bidding for? 1. Who are their customers – what segment of the market are they going after? 2. How are they targeting customers? 3. What is the problem for their customers they are solving? 4. How are they solving the problem? What features in the product support that? 5. How do they plan to scale and grow? Typically after this detailed analysis you will get a clear idea of what your competitor is doing beyond their product to help differentiate from others.